The 2017 edition of Access Across America: Transitreports that 36 of the 49 largest metros showed increases in job accessibility by transit. Though rankings of the top 10 metro areas for job accessibility by transit only changed slightly from the previous year, new data comparing changes within each of the 49 largest U.S. metros over one year helped researchers identify the places with the greatest increases in access to jobs by transit. Kansas City improved more than 17 percent. San Francisco, which ranks 2nd for job accessibility by transit, improved nearly 9 percent. In all, 42 of the 49 largest metros showed increases in job accessibility by transit. Why is Public Transport Use Higher in Australia than America and What to Do About It. Why does Australia have higher transit use than the US? In places like central Sydney, narrower lanes and expensive parking also make driving a burden. The Australian motorway system is less developed than the US interstate highway system, though the government is funding major new urban motorways in Australia (e.g. WestConnex in Sydney). Transit benefits because higher population and employment density (especially around transit stations ) within cities compared to most US cities (as well as a more urban population overall) reduces access time to and from transit and enables higher frequency service to serve the demand. The train, bus, and tram systems in Australian cities are relatively high frequency and fairly reliable, with all-day service. While the systems are imperfect (as any daily commuter will tell you) they are orders of magnitude better than most of the US. Transit service is a positive feedback system (The Mohring Effect, named for Transport Economist Herb Mohring who first identified it). More demand calls for more service, the additional service is in the form of additional buses and trains running at different times than the original service, reducing schedule delay, making transit more convenient, calling for more service. This works two ways, so transit cutbacks increase headways (decrease frequency) making transit less convenient, lowering demand, resulting in more cutbacks. From the 1920s when tram (streetcar) use peaked (notably excepting the spike during World War II) through the 1960s there was a process of Bustitution — substitution of buses for trams. Many cities around the world (notably excepting places like Melbourne, Toronto, San Francisco, and especially selected cities in Europe) instead of paying the costs of recapitalising their tram systems, opted to convert tram lines to buses that had much lower capital costs. In the US, there is a grand conspiracy theory, about how this came about. While most of the conspiracy theory is over-blown, there was some evil doing, as is the wont of people infected with greed (better known as people). In Minneapolis the people who converted the streetcar to buses went to jail, not for the conversion but for crimes like bribing state legislators and giving kickbacks. In Brisbane, the Paddington tram depot caught (were set) on fire as bus conversion was being debated, answering the question. In general, the reality is much more market-rational. Electric trams were first deployed in the late 1880s, so by 1950 the service was over 60 years old. Trams needed a major capital infusion to keep operating. That capital infusion was not forthcoming from fares; in the US trams had clearly been in decline for the better part of thirty years. It was a hard call for cities not to replace their trams with buses. The private sector, which financed trams initially, were unwilling to finance it again, leaving it to local governments to come up with money for the trams (or not, as it turned out). So most cities became tramless. Those cities were losing transit riders before the conversion and lost more after the conversion. It’s a vicious cycle. The new Light Rail mode (See Appendix) in North America kicked off with Edmonton (1978), San Diego (1981), and Portland (1986). In retrospect, many people regret the process of bustitution, and cities that later reinstalled LRT systems would with perfect foresight likely have kept their tram lines going and recapitalised them. Note that the actual coverage of these new system is much smaller than the historical trams, most tram lines were removed in most North American cites, as in Sydney. Wikipedia reports the farebox recovery is lower in Australia than US cities, which implies a higher public subsidy. (I am not convinced there aren’t methodological differences in accounting here, but it is worth noting). Why is Australia’s transit use rising when the US is falling? The second question is more difficult. One response is that fuel prices remain higher in Australia. Another is that there has been more investment in transit, including more frequent service and continuous improvements to stations and vehicles. Third, Australian cities have recently rolled out smart cards (Opal in NSW) like the Oyster Card in London, and along with it pricing reforms to reduce the fare penalty for transfers, which has significantly boosted use of transit. Australia does some other things differently from the US. Among them is increased use of contracting out to private firms to provide service. (This is not universal yet, but is growing.) This is also done in the UK and most of Europe, but not very much in the US. This has effects on costs and perception and unionization. 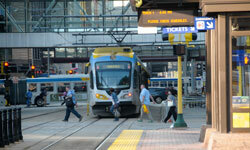 The contractors are for-profit businesses aligned with the idea of higher ridership, so support for transit in Australia is bipartisan, while in the US, transit is considered a Democrat issue in most places, and Republicans are often actively hostile as it is not their constituents (or only support transit to their suburban districts with high cost, low value commuter rail systems like Northstar in Minnesota). While transit in the US is perpetually in “crisis” (to listen to its supporters), in Australia (and Canada and Europe) it is a normal part of society that is widely used, and doesn’t have the same stigma associated with it. What should the public sector do to increase ridership? Looking at Sydney the densities are much higher here than in most North American cites, aside from New York, San Francisco, Chicago. I previously examined the existing and planned trams in Sydney. Because they are widely used, they have a strong constituency for their betterment, and government is responsive in expanding the system. Convincing existing some-time riders to ride more is far easier than going from 0 to 1 as Peter Thiel might say. I think early ridership gains come from going deep rather than going wide. A large fraction of the US still lives in areas designed around transit (basically pre-1920 America), including city cores and streetcar and commuter rail suburbs. Residents sometimes use transit now. These places are much easier to serve because the land use in conducive to transit, the densities are high enough and the networks are oriented for transit access and service. Good, relatively cost-effective service like Minnesota’s arterial BRT (bus rapid transit ) (MetroTransit’s A Line, eg) have shown large ridership and user satisfaction gains with low investment. The system is made more efficient with things like payment before boarding, and all-door boarding, reducing time at stops and increasing driver and bus productivity. The aim should be to serve users better, not help non-users by reducing congestion, which may be a happy byproduct, any more than building roads aims to reduce transit crowding. Mohring, H.(1972). “Optimization and Scale Economies in Urban Bus Transportation,” American Economic Review, 591-604. Streetcars or trams often share right-of-way in the street, while Light Rail often has a mostly exclusive right-of-way with at-grade crossings, but either system can be operated either way. Light Rail vehicles tend to be wider with higher capacity and longer with higher capacity, its longer vehicle is a heavier vehicle: Light Rail is not light, it’s only light with respect to commuter trains; it’s not light with respect to buses, cars, or people. Light sounds airy and like it should be less expensive, but it’s a only a little less expensive. Transit vehicles and services form a continuum, you can operate streetcars in exclusive tunnels as in Boston. Both LRT and streetcars differ from commuter trains but it’s a continuum in regard to that as well. Welcome to the June 2018 issue of The Transportist, especially to our new readers. As always you can follow along at the blog or on Twitter.